My Mind Wanders...: Happy Thanksgiving! Run, flamingos, far and fast! 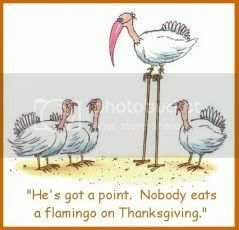 Or else this might be heard as little Johnny innocently asks, "Are Turkeys supposed to be pink? I thought..."
"Son, dark pink or light pink?"